Three people were injured Sunday after a small plane crashed into a house near Reid-Hillview Airport in San Jose, according to fire officials. Bob Redell reports. Three people were injured Sunday after a small plane crashed into a house near Reid-Hillview Airport in San Jose, according to fire officials. The crash occurred about 3 p.m. at 2156 Evelyn Ave., which is just across the street from the airport, San Jose fire officials said. Two men and one woman were transported to a hospital. One person suffered a major injury, and the other two were lesser injuries, fire officials said. The plane, a single-engine Cessna 172, crashed into the house's garage, but no one in the home was hurt. About 40 gallons of fuel spilled from the plane, and hazmat personnel were on the scene to clean up, fire Capt. Mike Van Elgort said. 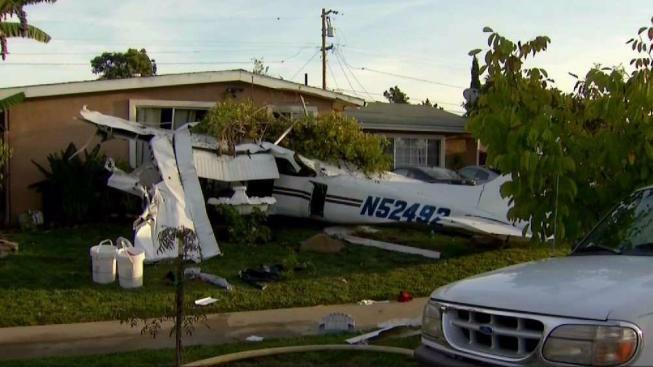 Three people were injured Sunday after a small plane crashed into a house near Reid-Hillview Airport in San Jose, according to fire officials. Thom Jensen reports. The fixed-wing plane apparently experienced some sort of equipment failure shortly after takeoff, and the pilot attempted to return to the airport before the plane went down. Witnesses said they saw the plane coming in low over the homes just before it went down. Marie Calderon was at work, talking to her daughter on her cellphone when he daughter began describing the crash as it was happening. "It went so fast and then crashed. That's what she said," Calderon said. "Quite honestly, we're thankful it hit where it did instead of people on the side of the road or in a car," Van Elgort said. "As bizarre as this was, the outcome is about as good as we can expect." The plane is registered to McClelland Aviation Inc. of San Jose, according to Federal Aviation Administration records. Owner Mike McClleland said the plane was rented by the hour to two pilots who had rented from him in the past. McClelland said he owns nine airplanes, and this is the first time he has had a crash. The home's occupants were temporarily evacuated until the fuel was cleaned up, Van Elgort said. The Red Cross was on the scene to assist a total of six people with temporary housing, officials said. The crash is being investigated by officials with the National Transportation Safety Board and FAA.